A light and deeply flavored halibut soup with watercress made with shrimp stock as a base and added Asian herbs for additional flavor. Both gluten-free and dairy-free. This week I had to buy a new computer. Not by choice. Quite the opposite. More against my will than anything. I bought a new computer 2 years ago right before D and I started our two year backpacking adventure around the world. And while I haven’t done that much on the computer (well outside of filling up 600 GB of disk space with travel photos) the computer had been dying a slow death for the last few months. Whether it was overheating or just freezing, it was clear I would need a new computer before our road trip started. I was holding on to that last breath of hope, thinking my dad the computer whiz could zap it back to life. No such luck. And so off to Staples I went, reluctantly, in search of a new computer. At a price of $250 I couldn’t turn down the 15 inch Asus laptop they had there for sale. I mean I seriously could not belive you could buy a fully functioning laptop for only $250. Last time I got a laptop back in 2012 the best deal I could find was $450. Now that price has dropped by nearly half. HALF. How could you ever justify buying a fancy Macbook for over $2000 when apparently laptops are being given away for less than the price of a flight from Boston to Florida. I mean seriously?! Can you tell I’m not an Apple fan? Another thing I’m not a fan of – Windows 8. I mean is that just about the worst thing that Windows could ever design or what? Where is the Start menu? How could I possible find order on the Desktop without a start menu? Remember when I shared my pumpkin chia pudding and ranted about being a late adopter? Well here this is shining through again. If it were up to me I would probably still be using Windows 95. Windows XP finally eventually grew on me, but Windows 8, no way. Thankfully there is an app you can download to disguise the Windows 8 operating system to look like the regular standard Windows 7. If not for that, you might just be seeing me purchasing old used computers in pawn shops for the rest of my life. Since today’s rant is all about how I prefer the improved and updated to the new and shiny, this halibut soup fits right in. Years ago I shared an Asian fish soup recipe which my mom came up with that I always used to request when I came home to visit. Well this is that same recipe with a bit of an upgrade. Improved but not new. Just how I liked my computer, I like my recipes too. Why make a completely new soup, when I just bring some new life into an old recipe? This is one of my all time favorite soups, and the shrimp stock adds a ton of flavor as does the watercress fresh herbs. So next time you’re peeling raw shrimp, save those shells and make a broth out of them. All you need to do is boil the shells and you’ve got an incredible soup base ready right there. 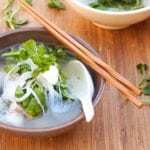 From there it’s all pretty simple, a few key ingredients, some halibut fillet, some rice noodles and fresh watercress, and your halibut soup is almost ready. 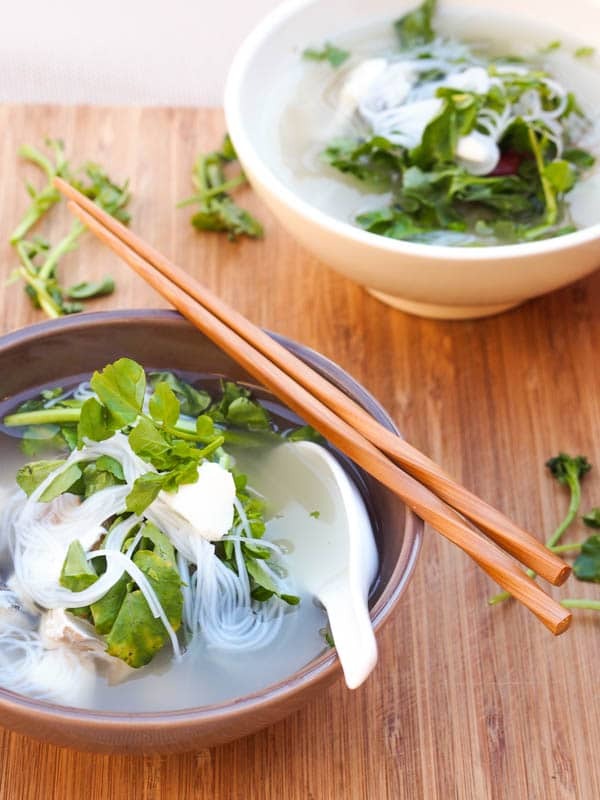 A deep and rich broth with soft white fish and crunch and fresh zing of the watercress. Naturally both gluten-free and dairy-free. This halibut soup is a family favorite. We make it all the time and the flavors of the fresh and crunchy watercress contrast nicely with the soft fish and rich fragrant broth. Let me know what you think of my halibut soup recipe in the comments below! Cook shrimp shells in 2 liters water, bringing to a boil and reducing heat to low. Simmer for 15 minutes. Remove shrimp shells and discard. Add lemongrass, ginger, fish sauce and chili garlic sauce. Bring to a boil. Add halibut and cook for 5 minutes or until fish is cooked through. Remove from heat and add lime juice. In a separate pot bring water to a boil and cook rice noodles for 2-3 minutes or until soft. Rinse with cold water and drain. 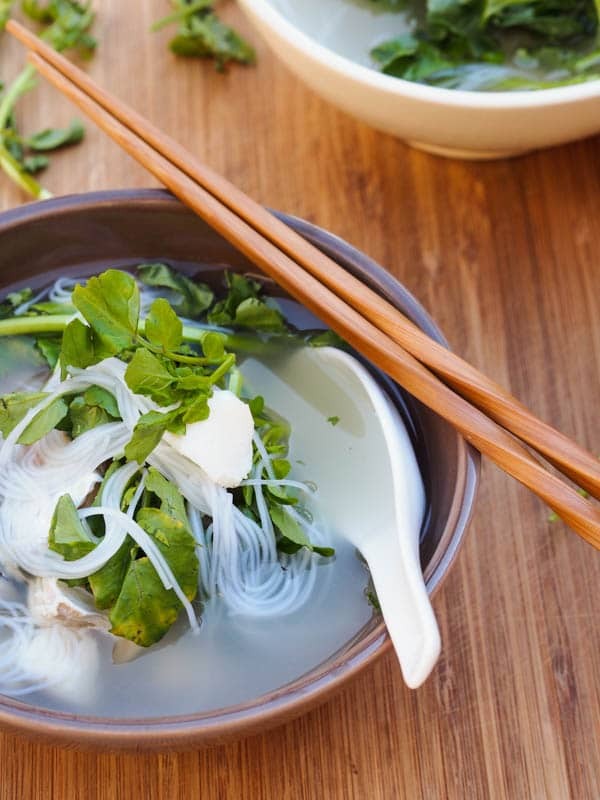 Serve soup with rice noodles and handful of watercress. Did you ever have Windows Vista?? It was so, so, so bad. Like death bad. Anyway, I’m love this sound. Fish-based soups are something I never really think to make, but they are so good! I love the addition of watercress. It would totally add the perfect pop of flavor! Shrimp shells are the casing that shrimp is covered in. When you peel the shrimp you peel off the shell and usually discard it, but save the shells to make a flavorful broth. I’m not an Apple fan either. I tend to kill my computers after two years. No idea how it happens but it does. I love halibut though! This is such a unique way to serve it. This looks terrific! Can’t wait to make this.